TNSTC – Kumbakonam is the public transport bus operator mainly in the districts of karur, Trichy, Perambalur, Ariyalur, Thanjavur, Thiruvarur, Nagapattinam, Pudukottai, Sivagangai Ramanathapuram and karaikal (PY). TNSTC – Kumbakonam was formed with merger of erstwhile CRC Cholan Roadways Corporation, DCTC Dheeran Chinamalai Transport Corporation, VATC Veeran Azhagumuthukon Transport Corporation and MPTC MarudhuPandian Transport Corporation. on June 20 2013, a new regional office at Nagapattinam opened for better operations on Nagapattinam, Thiruvarur District. and Karur for Karur District. Registration Nos: TN68, TN45, TN55, TN63. Presently TNSTC – Kumbakonam operates city buses in important cities of karur, Trichy, Perambalur, Ariyalur, Thanjavur, Thiruvarur, Nagapattinam, Pudukottai, Sivagangai Ramanathapuram in Tamilnadu and karaikal (PY). It also operates long distance services and Super Deluxe Buses to chennai and other Tier II Cities. 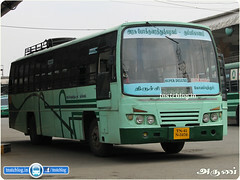 It has the pride of operating Super Deluxe Buses other than chennai to Tier II Coimbatore city. Super Deluxe Buses ply from Kumbakonam and Trichy to Coimbatore. Kumbakonam : Kumbakonam Mofussil, Kumbakonam Town I, Kumbakonam Town II, Thanjavur Mofussil, Thanjavur Town I, Thanjavur Town II , Orthanadu, Peravoornai, Pattukottai, Trichy, Thiruvaiyaru. Trichy: Rock Fort, Dheeran Nagar, Thuvakudi, Lalkudi, Trichy Mofussil, Contonment, Manaparai, Thuvarankurichi, Thuraiyur, Ariyalur, perambalur, Jeyankondam, Uppiliapuram. Pudukottai : Pudukottai Town, Pudukottai Mofussil, Trichy, Ponamaravathi, Aranthangi, Pattukottai, Gandharvakottai. Karaikudi : Karaikudi, Devakottai, Sivagangai, Thirupattur, Mudhukulathoor, Kamudhi, Ramnathapuram City, Ramanathapuram, Paramakudi, Rameswaram, Madurai. Nagapattinam: Chidambaram, Sirkali, Porayar, Karikal (PY), Mayiladuthurai Town, Mayiladuthurai Moffusil, Nagapattinam, Tiruvarur, Mannargudi, Nannilam, Vedaranyam, Thiruthooraipoondi. Karur : Karur I, Karur II, Musiri, Aravakurichi, Kulithalai. In Nagappattinam region, kindly add Mannargudi and Sirkali. Sir, Unfortunately ,today I boarded a town bus bearing noTN 63 N 1067 @ KILAKARAI AROUND 11.48 PM & got ticket to PALKARAI bearing nosCAA44/96159.As I am new to the area, I requested the conductor to inform the stage he informed me to ask the next passenger. While I reminded him of his duty of informing the stage, he scold me using unparliamentary words besides telling that he he was medically sick to say the stage. One and only division covers 10districts and partly of cuddalore(chidambaram) district and puducherry(karaikkal) state! In TNSTC-Kumbakonam Region, there is no depot at Trichy. In TNSTC-Nagappattinam Region, Mannargudi and Sirkali depots should be added. In TNSTC-Pudukkottai Region, Alangudi depot should be added. Hello officais in TNSTC, please run buses from Mayiladuthurai (Mayavaram) to Pattukottai. As there is no direct bus service from both ends. If TNSTC runs bus between to places it will be help many passengers. The bus should run via Peralm,Tiruvarur, Mannargudi and Madhukkur. Please add new bus from thanjavur to aranthangi via pattukkottai and pattukkottai to thirunelveli for many more useful in this area peoples…. Please give me suggestions to travel from thirunallar to pillayarpatti in day time. We are request you to, Please add a new route from KUMBAKONAM to CHENNAI (VIA – PANDANALLUR) timing details are follows…..
plz open a new depot at tiruvarur district in muthupettai town. then start to muthupettai to chennai(via kumbakonam,tindivanam) , muthupettai to coimbatore (via thanjavur, tiruchi, karur , palladam). and muthupettai to kanya kumari in ECR rout. I am one of the regular travellaer from Sirkazhi to Chennai on every sunday night. One bus left sirkazi by 10.15pm. i will go to book a tkt sunday Morning by 7 am the bus is full reported by a booking clerk every sunday, and they said 2nd bus by 9.15 pm that is also full expect seat no 30 to 41. every sunday many more people fight with reservation clerk. Last sunday after bus started 8 seats allotted by reservation clerk. most of the tkt sold out of reservation. pl look into the matter seriously remove those reservation clerk after verifying this . pl keen open chart before the passenger. pl do the need ful. keep vegil; on this thank you. dear sir please open jayankondam to thanjavur. dear sir please open ariyalur district thoothur to trichy. who is the manager/GM of TNSTC-Kumbakonam branch, ? i would like to know about GM name of the tnstc-kumbakonam branch. In Jayankondam depo, they operated maximum buses as express bus in trichy route. In 23 buses they operated 22 buses as express buses. So please take necessary action. I lost my luggage in the bus no TM 0402 – 425J. I was traveling in the tnstc bus from vellankanni depot to Naggapattinum station on 19.09.2015, the bus started at around 7:00 pm from vellankanni and droped us at 7:25 pm near Naggapatinum station. We forgot to take our bag from the bus which was kept under our seat near the front exit door, the bus went further to Naggapattinan depot and than further towards its route. We went to Naggapatinum depot at around 8:00 pm and inquire at the counter, but unfortunately the bus had left, so we were told that the bus would stop at Thiruvur Depot next, we went there too, but could not find the bus. It was a green colour bag with the name mention on it as vellankanni jewelers Mumbai. We request you to kindly look into it and investigate further to locate our lagguage. Attached is the copy of the bus ticket for your reference. Incase if this letter is not address to the concern dept. than I request you to forward this letter to the right dept. and help us locate the bag. You may reply on the below mention address. Opp. Forest office near teen hath naka. Please add more Air Conditioned Bus services from Trichy to Chennai. sir iam from umbalachery. In our road there are 2 bus running but at evening correctely at 5pm, we have one bus after 3.30pm bus school ends after 4pm. In 5pm bus we have more crowd due to crowd the school will travel in footboard.so please run another one bus to our road at evening. Ariyalur & Perambalur is District headquarters, there is no bus service From (Ariyalur/Perambalur) To (Bangalore/Hosur). At Kumbakonam the bus stop opposite to TNSTC office find difficult for passengers to drop. There is a speed breaker at the spot. The buses have to reduce their speed at the point. Some conductors ask the passengers to get down from the bus at this point. Some drivers would not stop the bus. The conductor hurry the passengers to get down, when the bus is moving. Moreover some conductors won’t announce the passengers to get down, when the bus stops for traffic. After passing from the point conductors refuse to stop. They ask why don’t you get down when the bus slow down. This is a matter of safety. Hence, i request the official in-charge instruct all conductors to get down the passengers properly. Thanking you. Sir, Please operate the new route bus From Trichy dist, Thuraiyur to Tanjore via Kottathur , Puthanampatti , Edumalai, Thirupattur Bramma Temple, siruganur, Lalgudi, anbil, poondi, Thirukattupalli , Thiruvaiyaru. It is most helpful to the devotees and officals. Thuraiyur to Kumbakonam via kotathur , Puthanampatti, Edumalai , Thirupattur, Siruganur, Lalgudi, Thiruvaiyaru , Thingalur , Swamimalai is another useful direct service to the public. From Trichy Dist Musiri To Perambalur via Thandalaiputhur, Pulivalam, Puthanampatti, Thenur, Chettikulam. Musiri to Ariyalur via Puthanampatti , Siruganur , Pullampadi , dalmiya. another short route for passengers. Iam siva. from kumbakonam(sholapuram). Pls open new route. Kumbakonam to salem via anaikarai,vadalur, neively,viruthachalam,aathur. In tnstc kumbakonam dippo only. Could you please update the Bus time and journey hour from Pattukkottai to Covai. I siva.form Kumbakonam. I reqeust for new route.kumbakonam to salem via anaikarai, sethiyathope, vadalur,neyveli,viruthasalam,attur in useful public and mahamaham funcation. Dear Sir, We are Regular visitors to chennai, Please add up new bus route from KUMBAKONAM TO CHENNAI (VIA Pandanallur, Pondy) for day time and night time. Dear Sir. We reqeust for new route.kumbakonam to CHENNAI via PANADANALLUR, Chidambaram, Pondy, ECR in useful public and mahamaham funcation, Daily Morning starting at 10.30 AM & Evening 8.30 PM from Kumbaknam Via Pandanallur. 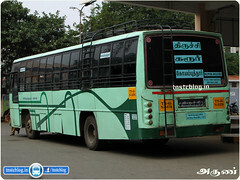 This buses very helpful to regular Chennai travelers. Pleas look into the matter seriously and operate the buses before Mahamam functions. please inform the timings for kumbakonam to pondy buses . please give me information about karaikkudi, Devakkottai Branch managers Mobile no or Depo phone no.any one . We are 3 members travelled from thindivanum to perungulathur. Normal bus fare from thindivanum to perungulathur is rupees 60. But conductor in this bus collected us 75 rupees for each. We asked the reson, he said that this bus is special and he didnt gave any prior information about the fare. karaikal to Poonthottam Karaikal to Nannilam Karaikal to Thiruvarur Karaikal to eravanchery and from karaikal to Mannargudi Karaikal to thiruthuraipoondi. Yesterday at 5 00 p.m., I have boarded your BUS No. TN 63 A 1642 A/THI, KA/ERA at Periyar Silai Stop through back door. As the seats are vacant in front portion, I moved alongwith my spouse. The conductor, without giving space for us to move, insisted for tickets. By squeezing our body, we managed to sit in the seat. Then we have took the ticket for Devakottai. For that, he ridiculed us. Being a Senior Citizen, I wish to keep quiet. He is not fit for conductor. Before a lady passenger gets down at First Beat, Driver took the bus. What the conductor does at that time. God only knows. Kindly impart necessary training to the running staff in the matter of how to behave with people and to do their duty in letter and spirit. Kindly advice the concerned suitably. Pls add new citybuses in ramnad dist….now running the buses are very oldy and 10years aged buses…. ex: tn:63 n-1000 series. Pattukkottai to karaikudi distance for 83km but take a time for bus 3 hrs..for all express and ordinary buses..so reduce travel time…. There is no direct service from trivandrum to kumbakonam. Since kumbakonam depo is one of the biggest depo in tamilnadu, it will be very helpful if we got a direct service(ultra deluxe). Chennai to mayiladuthurai most of SETC UD bus are very old and poor condition..if possible plz replaced in that bus’s.. If I take a bus from trichirapalli to mettupalayam will the bus go via covai or through avinasi. Please provide me the government (TNSTC) bus timing from Mannargudi to chennai with route details. tnstc kumakonam only importance give to kumbakonam. tnstc have 8 divisions in tamilnadu. the best divisions covai. the worst division KUMBAKONAM. Sir, Provide information about your routes ,Timings at various major bus stands. Instead you are wasting the website providing request letters from consumers. Tiruthuraipoomdi depo bus number tn 49 n 1873 When We Travel from trichy to thanjavur the bus Travel Like horse travel. Horse Travel in hill likethat We Travel in the bus. கண்டக்டர் டிரைவர் பாவம் ஸாா். I don’t know why all the Trichy-Madurai 1 to 1 buses are getting into Viralimalai for every time. They are already provided with the ordinary and 1 to 5 buses for sufficient number. This irritates the passengers every time when going inside Viralimalai and having board as 1 to 1. Definitely the corporation should take the necessary action. Also on travelling from Trichy to Chennai in ordinary services during Sunday nights, all the conductors are filling the buses by telling All bye pass Chennai. But we could not find a single bus without going inside Perambalur, Ulundurpettai, Villupuram and Tindivanam. This is unfair. Some of the buses should be tagged as 1 to 1 and follow the rule strictly. I want to know bus timings from Chidamabaram to go to VRIDACHALAM to reach by 10.30 am on 22/6/2017,THUURSDAY. I have to catch train(16127 Chennai Egmore to Guruvayur) at 11.30 am at Vridachalam station. Kumbakonam to Hosur , TNSTC Ordinary bus filming sollunga plz….. I have travelled from a bus from Pudukkottai on 06th Aug 2017. Its a normal bus which has charged me Rs. 240 as fare. But the conductor who got Rs.500 from me and told he will give the balance after getting change from Toll Gate, has not given it back to me. And i was in half sleep in the bus but he never tried to wake me up or even asked whom i should give the change in general. While reaching perungalathur in the morning around 5.30 i was in a hurry to go to my office so i stepped down there itslef. But when i approached Koyambed in the evening they are helpless and asked to contact the Kudanthai office. I have the ticked issued by conductor with me in which it was written as SHM 1. And the serial number is 69070. திருவாரூரில் இருந்து காரைக்காலுக்கு இயக்கப்பட்டு வந்த பேருந்துகள் நிறுத்தப் பட்டு விட்டன. பயணிகளுக்கு பெரிதும் பயன்பட்டுக் கொண்டிருந்த அப்பேருந்துகளை மீண்டும் இயக்க வேண்டும் என்று கேட்டுக் கொள்கிறேன். வழி : கீவளூர், நாகப்பட்டிணம், நாகூர். வழி : நன்னிலம், பேரளம், திருநள்ளார். I m a govt clg student.can i use the bus pass in express? Please reduce the travelling time between karaikudi and pattukkottai. Because of distance only 83kms but tnstc kumbakonam buses only taking 3hrs (tnstc madurai division bus taking 2.15 hrs and good speed also). 5. Pattukkottai to rameshwaram (via aranthangi, karaikudi, devakottai, ramanad)….. There is one incident happen to me too. I went to India from Malaysia with my daughter, niece and nephew. I took the bus from Trichy bus station to Ramanathpuram. After reaching one place they drop us for a bio break. Due to many people in the ladies toilet so we have to wait. it was delayed 5 mins… The conductor through all our bag and ask my daughter 10 years girls and 16 years old boy to go down from the bus. My bags damage and all the things come out of the bag. It was very disappointing. Due to this kind of person, spoiling Tamil Nadu transportation department. I do ask the with white shirt men who in charge of them, but he spoke to me very rudely and know basic manners at all. he asks me to buy again ticket and go without making so much noise. I wrote a complaint immediately pass to information counter. only God knows any action taken or just through my paper into dustbin. How could the driver and conductor no humanities at all. Please changed this kind of conductor and driver.